This Egyptian poster was designed by Hassan Mazhar Gasour and Morteda Anise to promote the 1981 100-minute Saad Arafa color film I Am in His Eyes starring Naglaa Fathy based on a story by Selmi Shalash with screenplay and dialogue by Ahmed Saleh and cinematography by Wahid Farid. Plot summary: A young woman named Amal [Naglaa Fathy] was injured in an accident with an automobile driven by a rich man named Adel, [Mahmoud Abdel Aziz] who took responsibility for her treatment. Adel arranged an apartment for Amal in one of his own buildings. Amal then realized Adel wanted to satisfy his desires with her, but she was not interested in an illegitimate ralationship. Adel loved Amal so he stopped womanizing and married her. Adel lived without working, relying on revenues from the buildings and factories he owned. He refused to restart a factory he had inherited because it reminded him of the tragic death of his father, who had been accidentally killed when he was a child. This had happened when his father was in a factory and a heavy tool fell on his head while he was tampering with some buttons. Amal felt her husband needed her to help him unravel a psychological complex. She talked him into restarting the factory and he became a new person. This poster was designed by an unknown artist to promote the 1960 115 minute Hassan Al Imam black-and-white film I Accuse [inni ataham], which according to Egyptian film encyclopedist Mahmoud Qasem is based on an unknown French novel called Jacques the Small (jak al-saghir] (apparently nothing to do with Emile Zola's famous 1898 letter titled j'accuse published in the French newspaper L'Aurore exposing the Dreyfus affair). The screenplay is by Mohamed Moustapha Sami, Mohamed Osman and Hassan Imam and cinematography is by Alevise Orfanelli. Plot summary: Plot summary: Naima's (Zubaida Tharwat) cousin Salah (Salah Zulfikar) loved her. He worked at the newspaper Akhbar al-Yom. A motorcycle ran over Naima when she was crossing the street. She recovered quickly but lost her eyesight. Her father Saber (Mohsen Sarhan) suffered a long time and provided the best education for her after he lost his job. He went to the hospital to see about his daughter but he forgot her briefcase with important items in it. There was a spat over this incident between him and the contractor Hamed (Imad Hamdi). Hamed persuaded all his colleagues not to hire Saber; he accumulated wealth while Saber lived in poverty. Hamed swindled the wealthy including Soad, whom he tried to marry by putting pressure on her brother Abbas, who was shot during their encounter. Saber came to Hamed's house at that moment and found the corpse. Saber was then arrested and accused of killing Abbas. At the trial there was a coroner's report on the shooting. Salah tried to shed light on the case in the newspaper while Naima tried to work a cure and recover her sight. Salah discovered Hamed's role and asked the court to interrogate him. In the end the truth was discovered. This poster was designed by an unknown artist to promote the 1945 115-minute Ahmed Badrakhan black-and-white comedy The Honeymoon starring Farid Al Atrache as Farid based on story and dialogue by Badei Khayri, screenplay by Ahmed Badrakhan and cinematography by Ahmed Khorshed. Plot summary: Hanna [Madiha Yousri] was a pretty girl who had to accept a marriage proposal from a man she did love. There was confusion when Farid promised Gamalat [Amina Noureddin] he would give her music lessons at his home. Each of the promised husbands of Hanna and Gamalat thought the other girl was his future wife. When Farid met Hanna he thought she was Gamalat and confirmed the appointment with her at his house. Consequently both girls went for the same meeting. The farce continued until Farid ended up marrying Hanna. 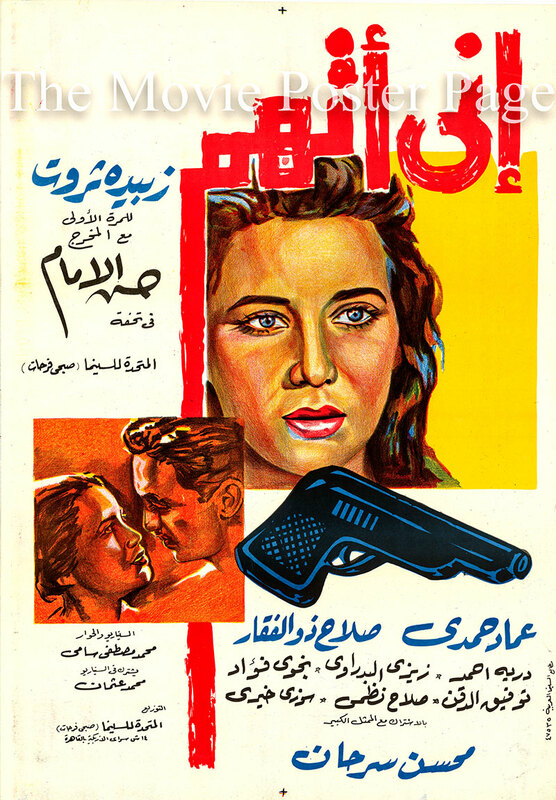 This is a poster designed by Abdel Alim to promote the 1968 100-minute black-and-white Abdel Moneim Shoukry film Honeymoon without Disturbances starring Hassan Youssef and Nahed Sherif based on a story by Ahmed Abdel Wahab with screenplay also by Ahmed Abdel Wahab, dialogue by Esmat Khalil and cinematography by Adel Abdel Azim. Plot summary: Monir (Hassan Youssef) was a young doctor who lived in Alexandria. He married the girl he loved (Nahed Sherif) against the wishes of his father, who was from Upper Egypt. The father read about the marriage in the newspapers, had a fit of rage and decided to kill his son. He was then surprised to learn that Madbouli, with whom he had an old quarrel, had been released from prison. The father knew Madbouli wanted to kill Monir to get revenge. During a chase Madbouli thought Monir was the nurse he had met at a clinic, then learned the truth and tried to kill Monir, but failed again. He fell in the water and almost drowned, but Monir saved him. This had a great effect on Madbouli and he stopped trying to kill Monir. The father married a woman he had met at a hotel in Alamein and the couple finished enjoying their honeymoon. This is a 23.5" x 35.5" Egyptian stone litho poster designed by Andrea to promote the 1949 100-minute Helmy Rafla black-and-white film Hoda starring Nour Al Hoda based on a story by Alexandra Nicola Badran (Nour Al Hoda) with screenplay by Helmy Rafla, dialogue by Badei Khayri and cinematography by Mohamed Abdel Azim. Plot Summary: A secretary worked with an important businessman. She set out to win his heart, he was overwhelmed, fell in love with her and finally married her to get her into his life. She found his daughter the student Hoda antagonistic towards her. His daughter rejected this wife who was not the right age nor in the right social position for him. Disputes erupted betwen the young wife and the daughter. The father could not avoid helping the wife and this caused another dispute between his wife and daughter. Because of this the daughter left her father's home. She decided to go her own way to pursue her artistic gifts, and she succeeded. On the other hand the wife began to devour her husband's assets, bringing him into bankruptcy. She left him and became estranged from him. He found himself alone until his daughter returned to him to reveal the secret of the plot his wife had devised with her lover to steal his money. He divorced her for revenge and returned to his daughter, regretting his bitter experiences after learning much from them. This Egyptian poster designed by Fathy Al-Khodri was made to promote the 1959 100-minute Hassan El-Seify black-and-white film The Highwayman starring Rushdy Abaza with screenplay by Hassan El-Seify, story and dialogue by Zaki Saleh and Stephan Rosti and cinematography by Alevise Orfanelli. Plot summary: Wahid (Rushdy Abaza) was a boy who lost his father as a child. His mother took care of him for a short time but then she also soon died. Wahid had a friend named Abou Ezz who worked as a drug dealer. Abou Ezz taught Wahid how to gamble and he lost all of his money. Then Abou Ezz proposed that he take part in a narcotics smuggling operation to get his money back. The police followed them and then Wahid was blamed for the killing of his cousin the officer Galal. Wahid deplored the murder and decided to kill his cousin's killer. He knew the killer was Al-Asmar the Dark One, a member of Abou Ezz's gang. Al-Asmar announced he was leaving the gang and going to Alexandria. Wahid followed him, shot at him, then fled in an automobile he stopped on the road driven by a singer (Hoda Soltan) with her writer friend. At the singer's home Wahid told his story to the woman and then the singer also talked about her past. Abou Ezz arrived at the home of the singer; the police arrived at the same time and arrested the members of Abou Ezz's gang. One of them admitted he was the killer Al-Asmar. Wahid was released and decided to marry the singer. This is a promotional poster designed by Mohammad Abdel Aziz and Moaty for the 105-minute Helmy Rafla 1974 color war film The Great Loyalty [al-wafa' al-'azim] starring Naglaa Fathy and Mahmoud Yassine with story, screenplay and dialogue by Faisal Nada and cinematography by Wahid Farid and Essam Farid. Plot summary: When Rauf [Kamal Al-Shennawi] got married to Soha [Hala Al-Shawarby] there was someone present at the wedding who opposed the marriage and wanted to prevent it. When the lights went out during an air raid this person took advantage of the sirens and shot and killed Soha while she was dancing with Raouf. Raouf's friend Ibrahim [Abdel Moneim Ibrahim] advised him to adopt a little orphan girl named Wala' [Naglaa Fathy] who had lost her parents in the war and later became a music student. Raouf became her father and she grew up with Adel, [Samir Sabri] the son of his friend Ibrahim, who became an army officer. Ibrahim wanted her to marry his son but Raouf objected. They planned to marry anyway; then Wala' met her neighbor Officer Safwat [Mahmoud Yassine] and they fell in love. Safwat went to ask Raouf for Wala's hand in marriage, but Raouf knew Safwat was the son of the killer of his bride, so he refused and drove him away. The October 1973 war was declared and Safwat went to the front. He met Adel and a friendship developed between them. Safwat learned Adel was engaged to his beloved; then he was hit during an operation and lost a leg. Adel learned the truth about the love between Safwat and Wala' and decided to withdraw from her life. This Egyptian film poster was designed by Al-Khad to promote the 1985 115-minute Ali Abdel Khalek color film The High [al-keif] starring Mahmoud Abdel Aziz with story, screenplay and dialogue by Mahmoud Abou Zeid and cinematography by Mamoun Ata. Plot summary: After Gamal (Mahmoud Abdel Aziz) failed with his studies he worked as a musician in a wedding band. His brother Salah (Yehia El-Fakharany) tried to get him to stop using narcotics and gave him a harmless substitute made in a lab. He advised him to use it and give it to his friends for the protection of their health. Gamal gave the synthetic material to a drug dealer. The drug dealer gave it to the gang leader (Fouad Khalil), who liked it and added some of the narcotic material to it. He sold the compound on the market, which reduced the demand for narcotics; then he asked Gamal to supply the quantities needed to meet the market need. He convinced him of the need to exploit the situation, especially since the compound just provided drug abusers with the illusion of a high. Gamal decided to record a vocal music tape. Salah discoverd the gang was mixing his compound with the narcotic material and decided to stop supplying them, but the gang kidnapped him and injected him with morphine until he became an addict and had to prepare the goods for them. The music cassette Gamal recorded was a hit. This Egyptian film poster was designed by Stamatis Vassiliou and Marcel to promote the 1956 95-minute Helmy Halim black-and-white film The Heart Has Commands [al-'alb lu ahkam] starring Faten Hamama with screenplay by Aly Al-Zarkany, dialogue by El Sayed Bedeir and cinematography by Ahmed Khorshed. Marcel and Vassiliou were two of the great early poster designers in Egypt (neither was Egyptian). This is the only poster I have where they collaborated. Plot summary: A girl attending medical college was a poor orphan living in the Bulaq neighborhood with her grandfather. The people in the neighborhood loved her and helped her with her living expenses. She loved one of her rich classmates at the college but he had no feeling for her or any sense of her emotions. Meanwhile an undertaker loved her and was also trying to marry her. The girl went to see a friend who owned a bakery in the Zeinat Sedky neighborhood and told her the secret of her love for her rich classmate. Her friend made a plan for her to get her classmate's attention. The girl then succeeded in attracting her classmate's interest and he promised to meet her at an acquarium. There she discovered he had been gambling with his classmates about making a hit with her, and she fled from him in sadness and disappointment. However the boy's sentiments, which began in frivolity, turned into true love and he offered to marry her. The girl took him to her home and told him about her poverty, but he was still determined to marry her. He told his father the rich contractor about it, claiming she was from a big family. His father agreed to hold a party at his mansion to introduce the girl before giving his final opinion. There was an aristocratic family that wanted to marry their daughter to the rich student by means of a speculative broker who would make a plan to prevent the marriage. At the party the rich contractor was surprised by the people of Bulaq who stormed the mansion at the broker's invitation. He realized they were the family of his son's fiance and his friends and he threw them out. However there was a brawl in which the members of the bankrupt aristocratic family tried to assualt the contractor and his son. The girl's friends intervened in the brawl, and the contractor agreed to his son's marriage to the girl. Shown here is an Egyptian promotional poster designed by Walid Wahig and Gasour for the 1970 79-minute Mamduh Shukry color film Delusions of Love [awham al-hob] starring Naglaa Fathy as Nadia with story, screenplay and dialogue by Mamduh Shukry and cinematography by Abdelhalim Nasr. Plot summary: After saying goodbye to her brother at the Cairo Airport Nadia met the artist Samir, [Yusuf Chaban] who felt something the first time he saw her. They established a relationship before they were officially married and lived as man and wife at a beach in Alexandria. They married later, but Nadia felt there was some change in her relatonship with Samir which showed itself as his desire to read and a preoccupation with books; it also included bordeom and tension in their relationship. Nadia was injured in an automobile accident, which caused her to have a miscarriage and lose some blood. Samir took her to a doctor to get her a blood transfusion, but a test of his own blood showed he had leukemia. He hid the test results from his wife with whom he was having so many problems, but he did not get a divorce. She left their home and returned to the gang of friends she had been with before the marriage. One of them named Farouk [Fathy Abul Sattar] took her to his apartment and they slept together. She went to her husband to tell him about the incident and gave him a lot of trouble. He had a nervous breakdown and could not find any solution other than divorce. His life had become a hellish fantasy and he could no longer control himself. His world was a confusing maze of contradictions. 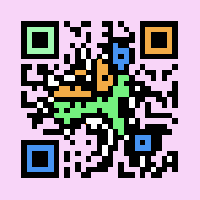 He died, accepting death with no regrets. The poster shown here was designed by Stamatis Vassiliou to promote the 1955 135-minute black-and-white Hassan Al Imam film Girls of the Night [banat al-lail] based on a story by Hassan Al Imam with screenplay and dialogue by El Sayed Bedeir and cinematography by Alevise Orfanelli. Plot summary: One of the girls of the night, the daughter of a decent man, fell into the ways of seduction and became a cabaret professional, but she was deeply unhappy and wanted to return to a pure upright life. One night the girl happened to see a conservative family who had been her neigbors before her fall. They loved her and made an agreement with her to save her. They welcomed her back into the old friendship that had connected the two families and agreed to a marriage between her and their son, believing she was still pure. The girl was pregnant and felt that her hopes for marriage had died, but the nurse who treated her told her to sell the child at birth to a barren woman who was afraid she would lose her husband if she could not give him a child. However the girl refused to sell her baby and decided to tell her fiance everything. Her fiance's father discovered the truth about her life and what she had done, forbade his son to marry her and threw her out of the house. Then the boy had an accident at work, broke his spine and was taken to the hospital. He was told an operation would be needed that would cost his father a lot of money. The girl learned about it and agreed to sell her baby and give the money to the hospital. The boy she loved was saved and then she had her baby and gave it to the barren woman, who took advantage of her husband's travel as a naval officer and told him she had borne the child in his absence. The days passed and the girl left Egypt for Lebanon. There she ran across her daughter with the woman who had bought her, and motherly emotions stirred in her heart. She followed the woman to Egypt, where she asked her to return her child to her. However the woman told her husband the whole truth and he went with her to the cabaret where the girl worked. There the fiance and his father met and tried to intervene to resolve the situation. They found the girl doing her dance on a high platform. She died after it became clear that the woman's husband was the baby girl's father, the one who had previously had a relationship with her. This is an Egyptian promotional poster for the 1963 85-minute Houssam El-Din Mustafa black-and-white film The Complaints of Girls starring Soad Hosny as Amani based on story, screenplay and dialogue by Adly El-Mowalid and with cinematography by Masud Isa. Plot summary: The story is set in the time before the 1952 23 July revolution. When the sons of Sheikh Salem, [Hussein Assar] who supervised Mahmoud Bey's [Adly Kasseb] farm, graduated from high school he decided to enroll them at Cairo University. Sheikh Salem went to Mahmoud Bey for help but he was against the idea of educating the children of farmers so Sheikh Salem's wife [Fatheya Ali] decided to sell her gold so she could send their boys Ibrahim and Ali to the university. Mahmoud Bey was angry and demanded that Sheikh Salem send his daughter Amani to work for him as a maid at his mansion. Despite the entreaties and tears of her parents Amani [Soad Hosny] had to go there and work as a maid, even though she had played with Mahmoud Bey's son Hossam [Ahmed Ramzi] since she was a child and they had fallen in love forever. However now she was a maid and because of that his father chose Shen Shen [Nawal Abul Foutouh] for him, the daughter of Prime Minister Al-Izmerli Pasha. Because of that marriage Mahmoud Bey was able to obtain money, an endowment and more wealth. Amani was angry about her childhood friend Hossam's proposal to Shen Shen, and she insulted her when she was walking with Hossam. Mahmoud Bey struck her with a whip, whereupon she ran away and got on a train to Cairo to look for her brothers. Her brothers Ibrahim and Ali had opened a sandwich stand inside the university to manage their expenses and their classmates were helping them. Amani came to support them. She worked with them and quickly became acquainted with their friends. She became so stylish that her brothers Ibrahim and Ali almost did not know her. For this reason Hossam, her childhood friend and a student at the same university, did not recognize her. Hossam loved Amani's new look and wanted to tell her he was in love with her, but one day she came to him in peasant clothes and told him who she was. Although he initially rebelled, in the end he asked her brother Ibrahim for her hand and love won the day despite the opposition from Sheikh Salem and Mahmoud Bey. The poster shown is an Egyptian promotional poster designed by Abdel Alim and Wahib Fahmy for the 1967 95-minute El-Sayed Ziada black-and-white film A Dancer from Sonbat [ghazia men sonbat] starring Sharifa Fadel as Salwa based on a story by Hassan Nashaat with screenplay and dialogue by Kamal Salaheddin and cinematography by Gamal Ebada. Plot summary: A dancer named Salwa rebelled against her family in the Ghawazi neighborhood in the city of Sonbat after they tried to make her marry an old man whose wealth they coveted. Salwa fled her hometown and her pushy parents for the city of Cairo. There she met Ahmad, Ruhia, Nabil and Barghuta, who worked at weddings as a band. She joined the team as a musician, but her success bothered Taghrid, the team's traditional singer and also the dancer Helawa, who decided to leave the band. There was a sense of crisis in the band but Salwa tried to make a place for herself and was successful with her songs. The band prepared a big show for presentation in the city's major theaters. Taghrid and Helawa decided to rejoin the band to be in the show, which was an immediate success. This is a 27" x 39" Egyptian promotional film poster designed by Al-Khad and Wahib Fahmy for the 1972 90-minute Ahmed Diaeddin color film From Home to School starring Naglaa Fathy as Soheir based on story, screenplay and dialogue by Adly El-Mowalid, cinematography by Ibrahim Saleh. Plot summary: In the years of adolescence a middle class girl in love is still going back and forth between home and school. At that age the emotions and the search for another person define one's adolescence and a girl will inevitably be subject to some sort of guidance and control. The control effort is not aimed at suppressing feelings; its purpose is to prevent a bad experience. It was in this context that Suhair (Naglaa Fathy) killed Essam (Ashraf Abdel Ghafour), a boy who had been approaching and enticing her frequently but refusing to marry her. She then went to the police and confessed to the crime. This is an undated rerelease promotional poster designed by Mohamed Abdel Aziz and Wahib Fahmy for the 1969 105-minute Hassan El-Seify black-and-white film The Frivolities of Girls [dili al-banat] based on a story by Naguib Al Riyhani with screenplay and dialogue by Bahgat Kamar and cinematography by Wahid Farid. Plot summary: Anwar Effendi (Farid Shawqi) was a simple employee in a government department. His colleague Ja'far encouraged him to marry the daughter of the office boss so he could be promoted. Anwar liked that idea. He lived in an old suburban house he had inherited from his family. In the middle of the night Fakria's (Nelly) automobile broke down on the road and she had to take shelter at Anwar Effendi's villa. She was the daughter of the jewelry merchant Al-Za'farani Pasha (Youssef Wahby) and Anwar knew her. Fakria asked him to let her sleep there until morning and he agreed under pressure. In the morning the boss and his wife came to visit Anwar, their daughter's fiance. Fakria knew they were coming and played a trick on them by sleeping in Anwar's bed. The worst happened, the boss had a fit of anger and left the house after making threats; Fakria ran away. Anwar Effendi followed her and asked her to explain the situation to his fiance's father. They met with the pasha who agreed under pressure from his daugher to explain the situation to the office boss. Things returned to normal; then Fakria went to the office to visit Anwar wearing indecent clothing, which got him fired. He went to talk to Za'farani Pasha about it, who became so angry with him that he beat him unconscious with whips. A doctor came to look at his wounds. Anwar asked the doctor to tell the prosecutor, but he refused because he did not want to cause any problems for Za'farani. Fakria nursed Anwar while he was recovering and fell in love with him. Za'farani Pasha knew his daughter was in love with Anwar, but he asked his daugher to marry her fiance Mimi Bey anyway. Since Fakria knew her father was in financial trouble she agreed to do it. The day Fakria was to marry Mimi she learned from her uncle that her father was not bankrupt after all; he had said this only because he did not want her to marry Anwar. She left to take refuge at Anwar's house and took a cleric along with her so he could marry them. The father Za'farani Pasha went too but he could not do anything about it and they married. This undated rerelease poster by an unknown designer advertises a 120-minute black-and-white film by groundbreaking director Mohammed Karim based on the William Shakespeare play Romeo and Juliet adapted by Abbas Alam with screenplay and dialogue by Mohamed Karim, cinematography by Mohamed Abdel Azim and musical score and lyrics by Mohamed Abdel Wahab. Plot Summary: Engineer Aziz [Mohamed Abdel Wahab] had to go to his home town after receiving a telegram about his father's death. On the train he met Fekria [Ragaa Abdou] and they were attracted to each other. It became clear the she was going to the same town but after his arrival he found that the telegram was just a trick his father had played to force him to go back to his home town to help him in the election campaign against his arch rival. Aziz also found that Fakria was the daughter of his father's rival and that he was actually her enemy. Aziz tried to get close to Fakria and talk her into making peace between the two families by marrying him. Fakria convinced her father that she would marry Aziz to get revenge against him and his father, and Aziz did the same thing. Both sets of parents tried to torment each other through their children, but Aziz and Fakria married and were deeply in love. The families visited the couple and pretended in front of them to go along with the previous agreement. The parents soon discovered that the couple had betrayed them and were happily in love. Aziz took the opportunity to convince the parents to make peace and come to terms. He succeeded in this, especially after one family's son married the daughter of another family; there were grandchildren at the end of the film. 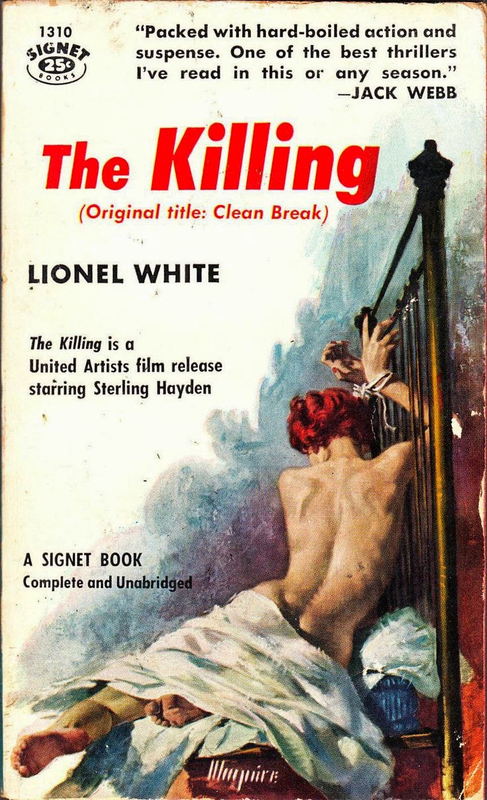 This Egyptian poster designed by Gasour based on the cover art by American artist Robert A. Maguire (1921-2005) for the 1955 Lionel White Signet paperback The Killing was used to promote the 1971 Hassan Al Imam 102-minute black-and-white film Forbidden Love [الحب المحرم al-hob al-moharram], adapted by Zeinab Hassan Al Imam from the Pierre Benoit novella Alberta with screenplay and dialogue by Faisal Nada, cinematography by Ibrahim Saleh and starring Madiha Yousri as Nahed. Plot summary: For more than 20 years the widow Elham educated her daughter and attended to the affairs of the home she inherited from her husband so her daughter Nahed could graduate. Nahed worked in Alexandria while her mother tried to comfort her and made arrangements for her to stay with somone close to her, the mother [Zuzu Shakeeb] of Kamal [Samir Sabri], who lived with her children Kamal and Zizi. At work Nahed made the acquaintance of her colleague Adham [Shukry Sarhan], one of Kamal's friends. Adham and Nahed had a mutual attraction that quickly turned to love. Nahed told her mother about it. However Adham became ill and remained at home with the mother and her daughter looking after him until he regained his health. Nahed went back to work while Adham remained with his mother. During that time the two hearts remained united, but while waiting for the marriage Nahed became distracted with her dreams and nightmares while driving, had a collision and was killed. Adham tried to comfort Elham but she was disconsolate. In the village Elham was surprised to hear the people whispering that Adham had killed Nadia to get her money. Elham reported Adham and he was was arrested on the night of his marriage to Kamal's sister Zizi. He confessed to his crimes.